There are a lot of reasons to go for concrete pool decks, they’re extremely versatile and there are tons of different things you can customize about them. If you’re someone who likes to be able to control all different types of layout and cosmetic choices, you’ll love the versatility of concrete pool decks. Your pool deck is a very important part of your pool. It’s where your guests will lounge for the majority of the time, so you want to make sure that it looks great and is customizable. Think of your pool deck as your outdoor living room. Why exactly should you choose to use a concrete pool deck rather than other options? Well, there are a number of reasons. Decorative concrete is a great deal cheaper than the other materials, and they can be manipulated to match a variety of other surfaces. You have an option of thousands of different colors and tints that can match any outdoor setting with ease. On top of the large variety of colors, you’ll also have many different aspects to customize as far as textures and patterns go. This can make your pool deck stand out and compliment your current outdoor feel. Along with being extremely customizable, concrete pool decks and pool deck overlays are generally much more affordable than other means. There’s no reason to spend more money when you can match the same look and quality for a fraction of the price using pool deck resurfacing. Having a concrete pool deck overlay installed is also extremely quick. It can be done within a day, depending on the size of your surface area. The materials used in concrete pool decks are also extremely durable. They’re made to withstand extreme weather conditions and will last for many years. It’s likely that you won’t need to worry about a replacement in your lifetime. 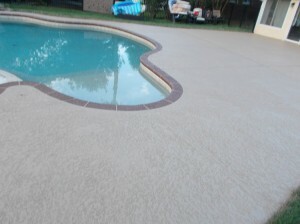 A good concrete pool deck with provide stability for your swimming pool and will look great doing so. There isn’t a whole lot of maintenance involved, either. Just give the deck a pressure wash once a year or so if you see fit. You also have the option to paint and seal your pool deck, but that is completely up to you. If you’re looking to add a stylish touch to your swimming pool, a concrete pool deck is a great way to go.